Wouldn’t life be better if getting the health care you need—and knowing how much it is going to cost—were as easy as shopping at your favorite store? If your experience is like most, you are whisked to the desk staff and promptly out the door before you can utter anything more than your phone number and preference of appointment dates. And even if you had the time, you probably don’t even really feel comfortable talking to your doctor about cost—at least most patients don’t. A 2015 study found that though 80 percent of patients said they would talk to their doctor about costs, 72 percent have never broached the subject with their doctors. 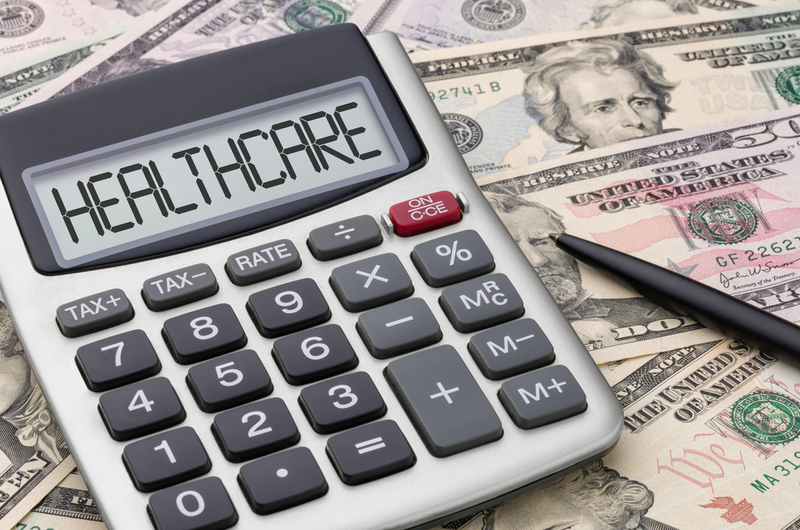 There are a few things you need to know that could save you a lot of money on your healthcare. It’s time to start talking about how much your health care costs and knowing that you have options outside of your doctor’s referral. In December 2018, The Wall Street Journal, published an article that looked into the “hidden system that explains how your doctor makes referrals,” describing the almost monopolistic culture of modern hospital systems. These hospital groups own everything from the hospital to the practice where your primary care doctor is employed. Doctors inside these systems face consequences when word spreads to higher-ups that they referred patients outside the system. There is actually a term, it’s called “leakage,” and it earns some doctors more than just a slap on the wrist if they fail to bring internal referral numbers up to par. WSJ reviewed documents and interviewed current and former doctors, lawyers, and hospital executives of various hospital health systems throughout the country, finding that physicians were under pressure to keep their patients within the system, even if the physician felt that an outside facility might be in the best interest of the patient. The healthcare industry is a $3.5 trillion business and patients are unwittingly burdened with the costs. The culture of keeping mum about health care costs is over. Patients, doctors, and health care businesses are evolving, but while in the midst of the evolution, patients (ahem, you) have to stand up for what is in their best interest. If you are like most Americans, you want to know your options: What am I getting and how much is it going to cost me? You can shop for health care. You can know what you are getting and how much it is going to cost you, before you book an appointment. When your doctor tells you that you need a procedure, like a colonoscopy, and makes a referral, don’t pull out your smartphone and mark the date on your calendar right away. Instead, ask why your doctor prefers the facility and request an estimate of costs. Take that information, go home and do a little research. Commonly prescribed procedures, national cash-based averages at an Ambulatory Surgery Center vs. Hospital Outpatient Department. Procedures at an ASC are typically 40 percent less than the same procedure at an HOPD. 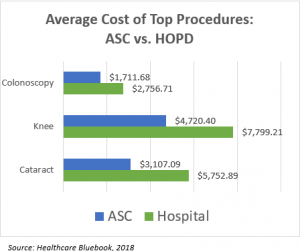 Websites like Healthcare Bluebook and even Medicare.gov Procedure Price Lookup, for Medicare patients, can give you the national average cost for the common procedures, often comparing hospital rates against independent facilities, like ambulatory surgery centers (ASC). In many cases, procedures at an independent ASC are at least 40 percent lower than the hospital. If you’re insured, preventive procedures are often covered at 100 percent for eligible patients at most independent ASCs, while diagnostic procedures are a fraction of the cost charged by hospitals. You can choose where you have your procedure, just like you can choose your specialist or surgeon. You don’t have to use the facility, lab or specialist your doctor recommends, even if it seems implied. You can find out costs at various facilities and discover what to expect during the experience by going online or making a few phone calls. Independent ASCs often offer lower costs along with amenities and touchpoints, such as pricing transparency, curbside drop-off and pick-up, shorter wait times, top-ranked industry accreditations and certifications for safety and quality. Your primary care doctor (or any doctor, for that matter) may refer you to an affiliated hospital, but ultimately you are in control of where you get your health care, not just procedures, but lab testing too. You can ask why he or she recommends a certain lab, specialist or facility, even if he or she touts the recommendation as the best, do a little homework and make sure it is the best choice for you. Tulsa Endoscopy Center is an independent ASC, specializing in GI care and endoscopic procedures, in Northern Oklahoma. Tulsa Endoscopy Center offers a seamless patient experience from scheduling to discharge, including pre-appointment confirmations, procedure preparation reminders, friendly staff, short wait and procedure times, curbside drop-off and pick-up and convenient parking. Every gastroenterologist is fellowship-trained, exceeding national benchmarks for quality of procedure performance, and supported by an expert staff that specializes in endoscopic care. Tulsa Endoscopy Center is CMS certified and AAAHC accredited, meaning the staff and facility must pass rigorous inspections to ensure that the highest level of safety and quality standards are upheld. Choosing an independent ASC, is more than just a cost-effective option, it is top-quality care that you and your physician can trust. Get in touch with us today for more information on our services!